As the name suggests, this is an extremely rich luxurious cake that should probably come with the warning: for die hard chocolate lovers only. Not to be confused with red velvet cake, the sponge cake lined thick mousse center is in it’s own category of cakes. At first taste of the filling, the richness is overwhelming as the coffee brings out the dark tones in the thick chocolate but finishes with just a hint of sweet Grand Marnier. 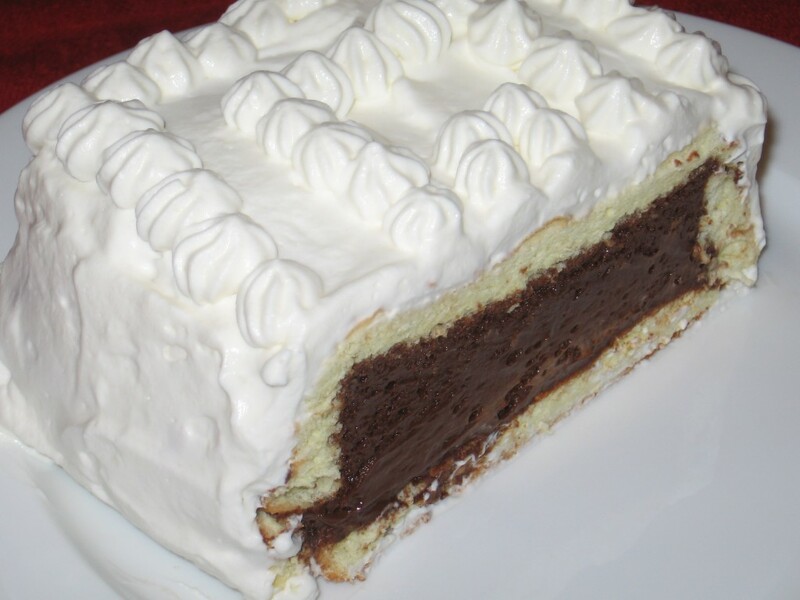 The sponge cake lining is frosted with just lightly sweetened whipped cream that balances the many different strong and subtle flavors of this velvety indulgence. Before you know it, that large slice you thought was too rich to finish, is gone. 2 cups heavy cream, whipped with 2 teaspoons vanilla extract, 1-2 teaspoons Grand Marnier, 1-2 tablespoons sugar, and gelatin (to stabilize for longer shelf life) – see note. 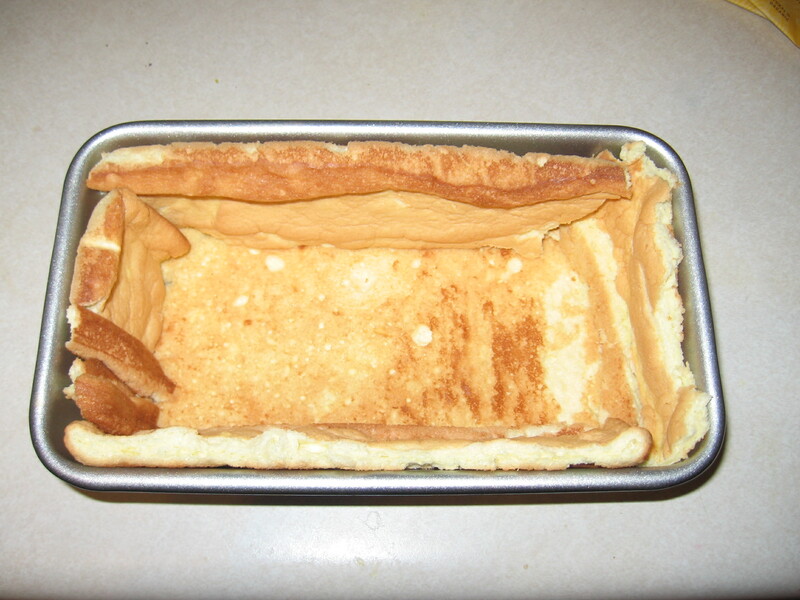 Completely line 1/2 quart mold or loaf pan with basic sponge cake by cutting out one large piece to fit the bottom of the mold; then, from remaining cake, cut out one long or two short strips to cover the sides. Reserve any sponge sheet left to make into a top later on. Melt chocolate (careful not to burn it) over very low heat. Add egg yolks, coffee, Grand Marnier. Stir together until smooth and heated through. Cool. Beat egg whites with salt until they hold soft peaks. Add sugar, a tablespoon at a time, beating after each addition. Continue beating 5 more minutes, or until very stiff. Fold unsweetened whipped cream and stiffly beaten egg whites together. 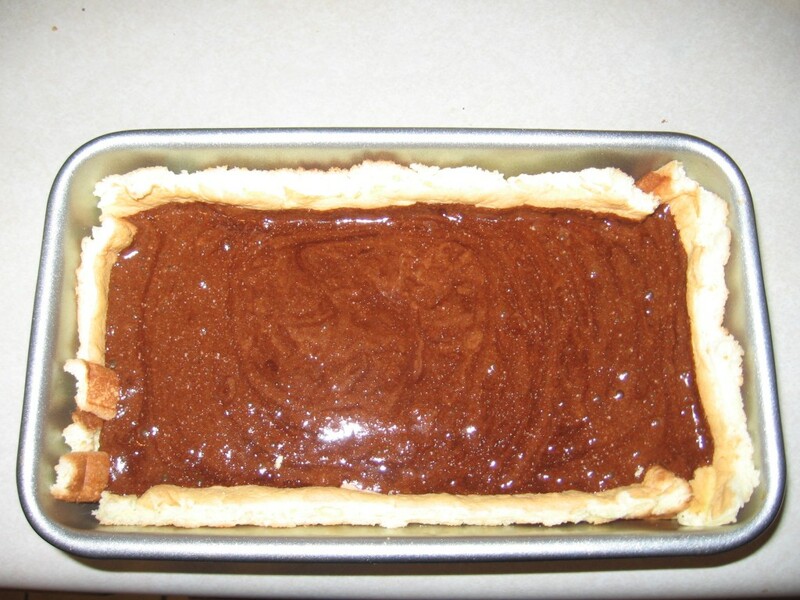 Fold in about 1/4 cup of egg white cream mixture into cooled chocolate to lighten. Pour chocolate mixture into remaining egg white mixture. Fold in gently but thoroughly. Pour into sponge cake-lined mold. Place in refrigerator for 2 hours or until filling is firm. Cover with remaining sponge sheet, fitting together any bits and pieces if there isn’t a single piece large enough. Loosen sides of the mold with a sharp knife. Turn out upside down on a plate. Frost all over with whipped cream frosting. Chill if not serving immediately. Chocolate Velvet maybe frozen before frosted, if necessary. Note: To prepare whipped cream with gelatin, soften 1/2 teaspoon of gelatin (for each cup of cream) with a tablespoon cold water. Set over a pan of boiling water (or double boiler) until gelatin dissolves and looks clear. Beat dissolved gelatin, sugar, extract, and liqueur into the cream just as the cream begins to thicken. 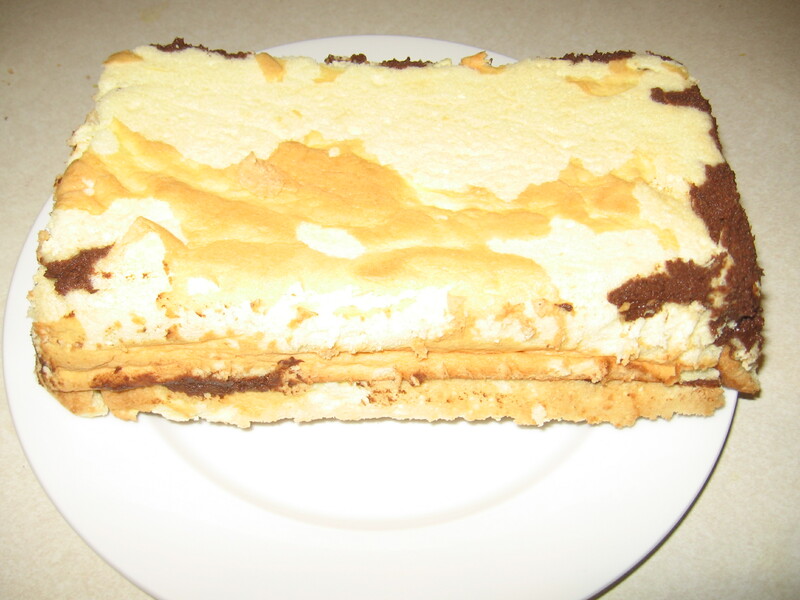 I first made this recipe from your grandmother’s original cookbook “The Art of Baking” by Paula Beck in December 1981. Unfortunately the book has gone missing, but fortunately I had the foresight to hand write the recipe. Recently I ran into an old friend that I tried out the recipe with. The subject came up and I told her I still had the hand written copy. I planned on giving her a copy then thought of Googling it as well…….and I found you! I hope to find a used copy of the original book. 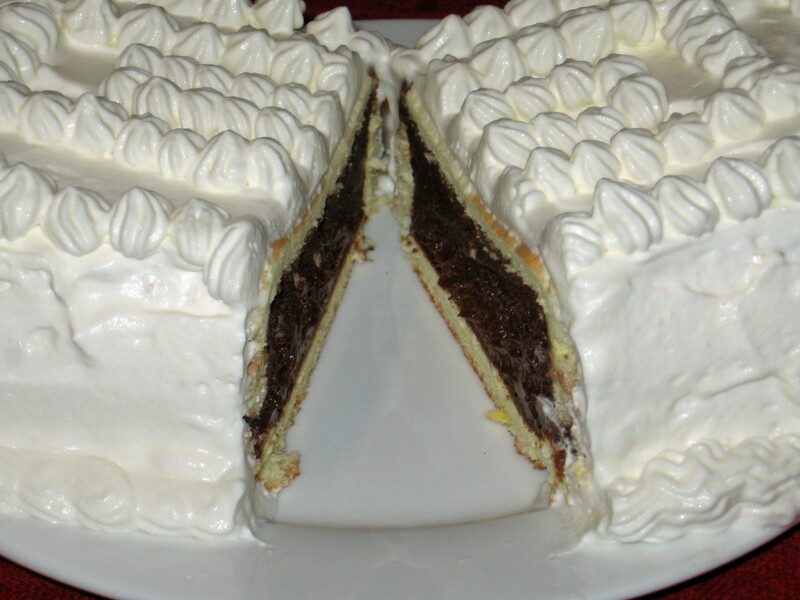 This recipe has gone full circle now; first from your grandmother and now to you……31 years and still loving Chocolate Velvet!